Factors such as increasing number of research and developments in oncology sector, advancements in drug development, new product launch, and the introduction of various new therapies are leading towards the growth of the global market for chronic myelogenous leukemia. Increasing prevalence of chronic myelogenous leukemia in developed countries due to genetic factors is also resulting in the development of new treatment and therapies that are more effective. Researchers are also focusing on polypharmacology approach to develop the drugs that can act on multiple targets. This is leading to the drug discovery opportunities that are beyond the concept of ‘one drug, one target’. The class of drugs known as TKIs is being used on a large scale, however, side-effects of these drugs are affecting its growth. Hence, new drugs and treatments are being developed to run the treatment successfully without any risk. Moreover, the rise in the development of a combination of drug therapies is also fueling the growth of the market. High-cost of treatment being the biggest factor hampering market growth. Manufacturers are focusing on reducing the cost of TKIs. Meanwhile, the government of various countries are also taking initiatives to provide TKIs to the large section of population who are not able to afford it. According to the report by Transparency Market Research (TMR), the global market for chronic myelogenous leukemia is likely to witness strong growth, registering 6.7% CAGR during 2017-2026. The market is also estimated to bring in US$ 8,550.8 million revenue by 2026 end. Disease specific treatment is likely to gain maximum revenue share, accounting for more than three-fourth of the revenue share by 2017 end. Disease specific treatment is also projected to exceed US$ 7,100 million revenue towards 2026 end. Compared to the other distribution channel, hospital pharmacies are likely to witness significant growth during 2017-2026. By 2026 end, hospital pharmacies are estimated to surpass US$ 4,600 million revenue. Meanwhile, specialty pharmacies are also likely to witness healthy growth between 2017 and 2026. Branded drugs are likely to gain maximum traction in the market during 2017-2026. Branded drugs are estimated to exceed US$ 6,800 million revenue by 2026 end. North America is likely to emerge as one of the largest regions in the global market for chronic myelogenous leukemia treatment. Increasing awareness about various new treatments among the patients suffering from chronic myelogenous leukemia, early diagnosis of patients suffering from cancer are some of the factors driving the market growth in North America. Other factors contributing to the market growth are presence of leading market players and rise in a number of approval of drugs by the U.S. Food and Drug Administration (FDA) for treating chronic myelogenous leukemia. Meanwhile, improving healthcare infrastructure in developing countries like China and India are contributing towards the growth of chronic myelogenous leukemia treatment in the APEJ region. Some of the major market players in the global market for chronic myelogenous leukemia treatment are Novartis, Teva Pharmaceutical, Bristol Myers Squibb, Hoffman-LaRoche and Schering Plough, Pfizer, and Others. The use of second and third generation therapies has recently increased due to the lack of benefits from imatinib. Hence, players in the market are working on introducing treatments and drugs that can offer maximum benefits. Chronic Myelogenous Leukemia (CML) takes place when the bone marrow starts making too many white blood cells. This may affect red blood cells, white blood cells, and platelets. The first line treatment for CML in chronic phase is being largely treated with targeted drugs such as tyrosine kinase inhibitors (TKIs) nilotinib (Tasigna) and dasatinib (Sprycel). Meanwhile, in the initial phase drugs known as tyrosine kinase inhibitors (TKIs) are generally successful in controlling cancer. Researchers are also trying to develop new strategies in order to test and identify new drugs efficiently and quickly. Researchers also believe that developing drugs that can act on multiple targets can be more effective in treating cancers with a network of alterations. It has also been found that combining drugs with treatments such as interferon, chemotherapy, and cancer vaccines can be more effective. Meanwhile, the University of Glasgow has also found that when antibiotic tigecycline combined with imatinib drug can eradicate leukemic stem cells and help in enhancing cure rate. More such research is being carried on to find better treatment for chronic myelogenous leukemia. 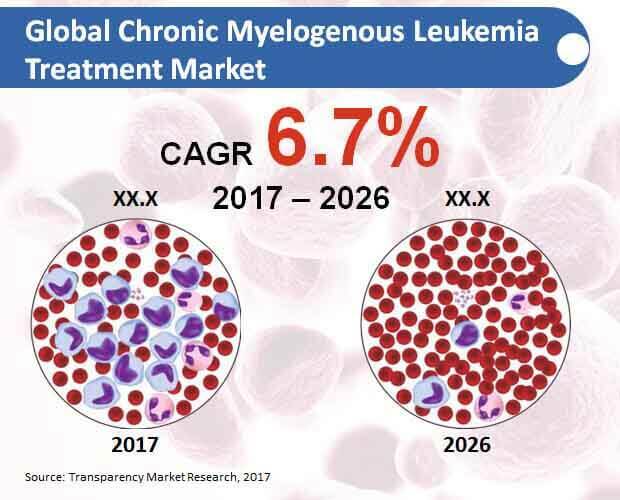 The report provides an in-depth insight on some important aspects of the chronic myelogenous leukemia treatment global market and offers key insights on the growth patterns and factors resulting in the market growth, important segments, and competitive landscape. The report provides both qualitative and quantitative analysis of the overall chronic myelogenous leukemia treatment market. The report also provides information on various factors shaping the market dynamics such as trends, opportunities, drivers, and restraints. The report also offers market attractiveness analysis, along with Porter’s five force analysis and SWOT analysis. Along with these, analysis on the market opportunity for the treatment type, drug type, distribution channel, and key developments has also been provided. Key developments including the events occurred in past and events that are expected to take place during the forecast period from 2017 to 2026 has been offered in the report. These industry developments are also likely to affect the market dynamics. The global chronic myelogenous leukemia treatment market has been segmented into type of treatment, distribution channel, drug type and region. On the basis of treatment type, the segment includes disease specific treatment and symptomatic treatment. On the basis of drug type, the segment includes branded, and generic. On the basis of the distribution channel, the market is segmented into hospital pharmacies, specialty pharmacies, and retail pharmacies. Geographically, the global chronic myelogenous leukemia treatment market is segmented into North America, Europe, Latin America, Asia Pacific Excluding Japan (APEJ), Japan, and the Middle East and Africa (MEA). The report segmentation includes country-wise analysis on the major parameters of the market. The forecast for each region, drug type, treatment type and distribution channel has been provided for the year 2017-2026. The CAGR in form of percentage and revenue share for each segment is included in the report. The report offers a detailed profile on various leading market players in the global chronic myelogenous leukemia treatment market such as Bristol Myers Squibb, Novartis, Pfizer, Teva Pharmaceutical, Hoffman-LaRoche and Schering Plough, and Others. The evaluation of these leading market players has been done on various parameters including company overview, product portfolio, financial overview, business strategies, and new developments. The companies are investing in the research and development of new treatments and drugs to treat chronic myelogenous leukemia.